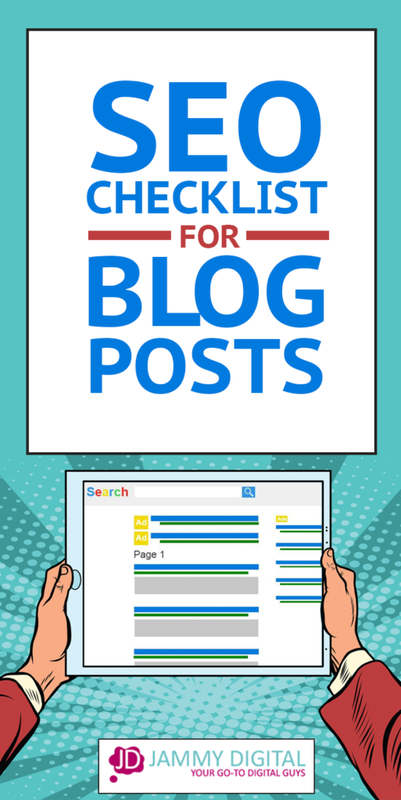 SEO Checklist for Blog Posts. How to Optimise your Content for Google. Writing content is hard work. It takes a long time to draft, re-write, edit, create images and then publish it. And after all of that, you have to think about SEO too? We’d like to think that producing great content is enough, but in reality, if you want to get found online, SEO is essential. But with all the advice out there, how do you begin to know where to start? This is why I created this checklist. I wanted you to have a go-to resource that you could use over and over again. After all, if you’ve spent so long writing a great blog post, you want to make sure you have as many readers as possible. Keyword research is used to gather a list of common words and phrases that people type into search engines and it’s still an important part of SEO. Understanding the popularity of certain words and phrases is an excellent way to reach more people. It’s also a good idea to use a keyword research tool to validate your ideas for future articles. Ideally, you would do your research before you begin writing, that way you can plan the structure of your piece with keywords in mind. However, even if you’ve already written your post, you may want to go back and confirm that you’ve at least considered the best keywords. You might have missed some key opportunities. Keyword research tools allow you to search for words and phrases and tell you the average number of monthly searches. You can use a number of online tools for this and most of them come with a free trial of some kind. Here are a few for you to try out. Here’s an example of what KWFinder looks like when using their keyword tool. You can read this very helpful review of KWFinder right here. What is the name or title of your blog post? This is usually the first thing people will see when they visit your post for the first time. The name you choose will also be the main heading for the post which makes it very important for search engines. For instance, my main heading at the top of this page is “SEO checklist to optimise your blog posts” This is also what will appear when you share your content on social media. Search engines will take note of the keywords you use in your main heading and use it to rank your blog post. This is why it’s important you take your time with it. It’s tempting to try to be funny or clever with your heading but I encourage you to tread carefully. I could have chosen something like “10 steps to search engine success” or “10 secrets to get more eyeballs on your blog” but the reality is, that kind of title doesn’t work as well as you think. “Buzzfeed” type blog titles are only good for one thing: getting low-value traffic from content junkies. You really don’t want your blog post being treated this way. They might get a couple more shares but you’re missing out on lots of organic search traffic. You also want to position your article as a valuable resource for your target market. Not to be confused with your domain, URLs are the unique pages on your website. 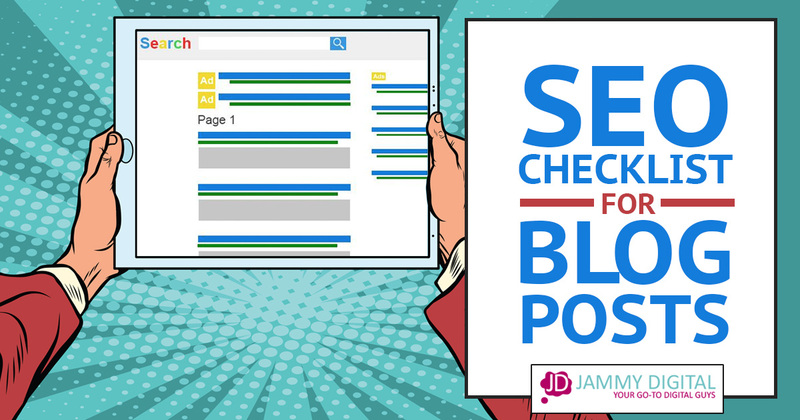 For example, the URL for this page is jammydigital.com/seo-checklist-blog-post. URLs are an extremely important part of SEO. Search engines take note of the URLs you have chosen for your blog posts and will rank you accordingly. URLs can also be called a page “slug” and depending on which content management system you’re using you should be able to change them easily. Below I’ve shown an example of how it looks in WordPress. 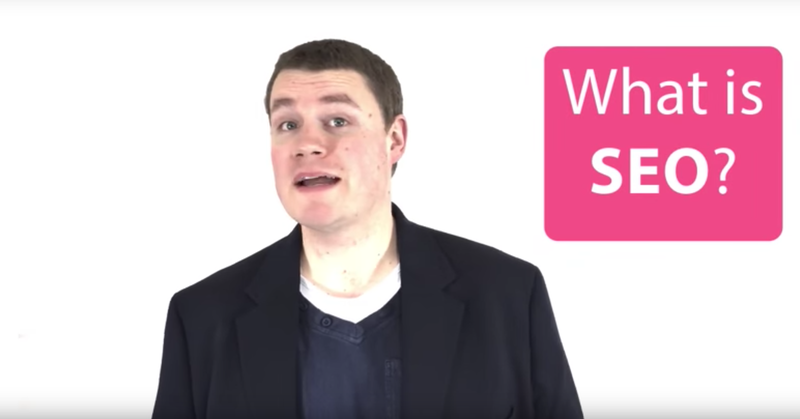 How to choose the best URL or slug for your blog post? You don’t want an extremely long and messy URL such as jammydigital.com/an-seo-checklist-for-optimising-your-blog-post-for-better-google-rankings. An extremely long URL doesn’t look very appealing to your users and less people will click through to your website and share it on social media. The headings you use within your blog posts will help decide what keywords you rank for. Search engines want you to use heading tags to break up your content, making it easy for their robots to understand. 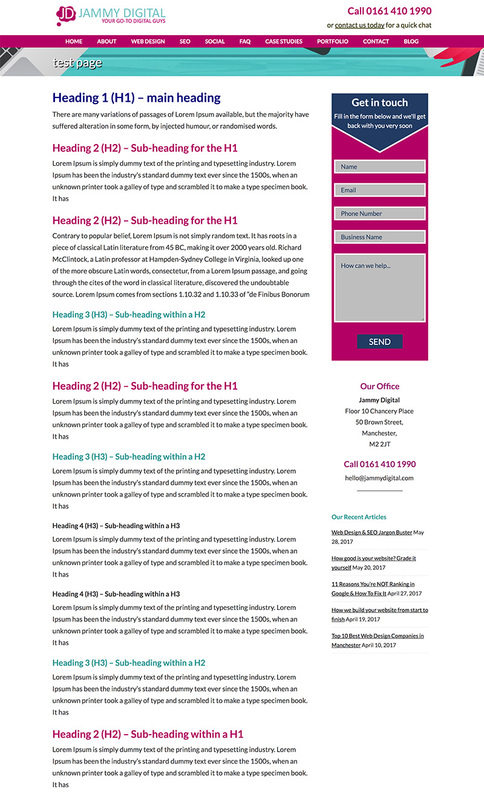 Headings also have the added benefit of breaking up your content, making it easy for your readers to consume. Your headings and subheadings should be used in a specific order as shown below. I often see people use H1-H6 tags randomly. They use the different H tags to style their article rather than use them in the correct order. Here’s an example of how you use them correctly as a blog post. These days, high quality content is absolutely vital if you want to rank on the first page of search results. I’ve seen this for myself over the past few years. It’s pretty much impossible to rank highly online with thin, low quality articles. It might have worked in the past but search engines can spot low quality a mile off. 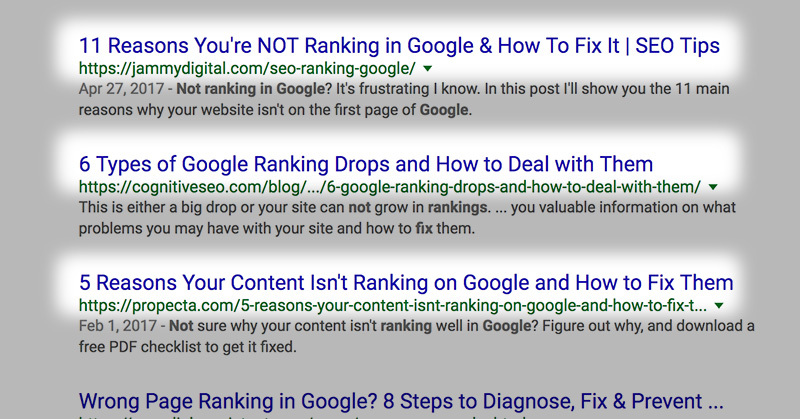 How does Google determine the quality of your content? All of these factors will determine how good your content is and will count towards your rankings. Most websites use images to brighten up an article or break it up so it’s easier to read. Whilst that is a good thing, it’s also possible to use your images to rank your article higher in search results. Search engine robots can’t see your images, they can only scan the information that you attach, which is why you need to take care when optimising them. To save time, people often leave this as it is and upload it to their website. The problem, is that you’re essentially telling Google that “IMG_0001” is what you’re hoping to rank for. You need to use this opportunity to describe the image so that it fits in nicely with your article. The file size of your images can also impact your rankings. Make them too big and your website will load slower and create a bad user experience for your visitors. A standard image size for a picture taken on an iPhone 7 is around 1500 kb (1.5 mb) and 3000px x 4000px in dimensions. The average laptop screen is around 1200px wide. So that means if you upload an image from your iPhone it’s approximately 3 times larger than it needs to be. As you can see from this ruler, the width of this blog post is around 750 pixels. There is absolutely no reason for me to upload an image bigger than this. 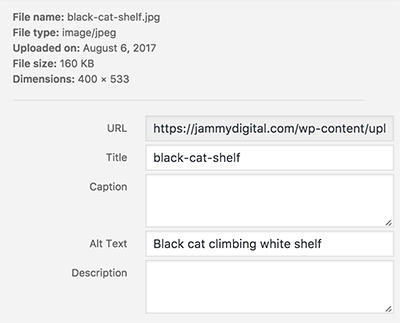 Even if you re-size the image once it’s on your website, it’s still been uploaded as a big file and this will have repercussions. Use a website such as Picresize to reduce the size of your images. Keep them as small as possible without losing the quality. 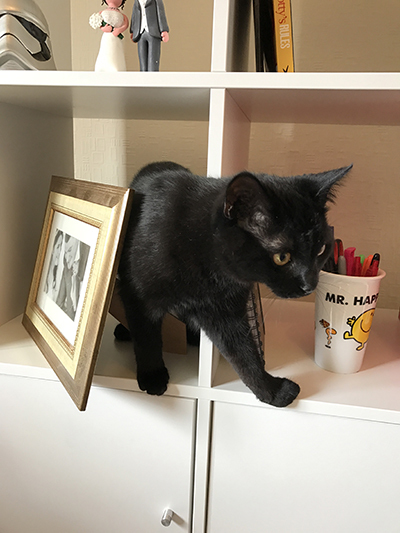 The image of my cat measures 400px wide by 533px tall and the size of the file is 160kb. This is tiny compared to a standard iPhone photo and could easily be reduced even more. Always, always, always reduce the image size before uploading it to your website!! Once your images have been uploaded to your website, you can add some Alternative text or alt text to explain what the image is. This is how Google rank your images in their image search tool. I suppose I could have also used “Muggles destroying my office like she always does” as the alt text. Sigh! Most content management systems such as WordPress will allow you add alt text without needing to access code. If you want to rank highly, your website should act as a valuable resource within your niche. Your articles are certainly going to help with this but you need to make the most of them. An internal link is where you create a hyperlink from one post to another relevant post. You can use a number of internal links within your blog posts to help your visitors navigate through your website seamlessly and allow them to consume more of your content. The more pages your visitor views will show Google that your website is valuable and they’ll likely send you more relevant traffic. Links can also be used to show search engines that your content is trustworthy. Each link pointed to an article counts as a little “vote”. It’s a good idea to try and link to each post on your website at least once. Another way to help Google rank your articles is to use keywords within your hyperlink when linking to a page. This is called anchor text. 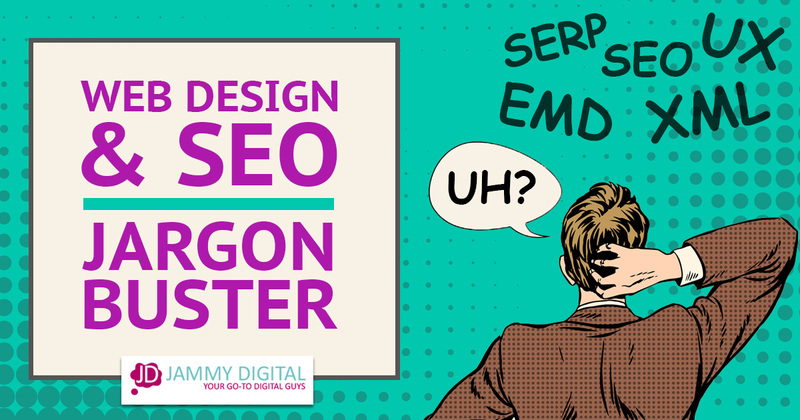 For instance, if I’m linking to a page talking about “SEO Jargon”, I would want to hyperlink the words SEO Jargon and not words like “click here” or “find out more”. This is a common mistake that lots of people make but it’s quite easy to fix. Not to be confused with the blog post title in step 2. Title tags are not visible on your website. They are mainly used by search engines to determine what your page is about. Title tags are another important aspect of SEO. Each page on your website will need to have its own title. The same goes for each of your blog posts. Although the title tag is mainly for search engines your users will still be able to see it within search results, so it’s important to take care when choosing your title tags. The title will be display on the search engine results page. As you can see it’s displayed in big blue text. You can edit your Title in your website dashboard. Here is what it looks like in WordPress. Use hyphens (-) or pipes (|) to separate sentences. It looks neater. Each blog post you publish will have its own meta description. It’s the small grey text beneath the URL on the Google results listings. As you can see, it’s longer than the title tag so there’s more room to include more information. Unlike the Title tag, Meta Descriptions are no longer classed as a strong ranking factor. However, they are still extremely important. The words you use here will determine how many people click on your listing rather than the other results on Google. A compelling description will dramatically increase your click through rate. A lot of businesses don’t spend the time producing quality meta descriptions and miss out on visitors. Categories and tags are used to structure the content on your website. 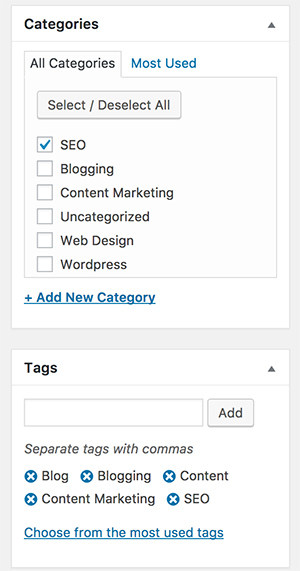 You can group certain content together by assigning a number of categories and/or tags. Although they don’t have a massive SEO benefit, this will make things easier for your visitors when browsing your website. There are no hard and fast rules about categories and tags but I like to follow a certain system that makes sense for users and search engines. A category is usually used as the MAIN topic of the post. For this post I’ve used “SEO”. I only tend to use one category per post but you could use more if you really needed to. Tags are used as extra topics that you speak about throughout the post. I usually use 5 per blog post and for this one, I used SEO, Blog, Blogging, Content and Content Marketing. As you can see, I’ve used SEO for the category and also a tag. I’ve found that by structuring each post this way, it allows me find my own content easier and has a nice clean pattern for my visitors to follow too. I also have a section at the bottom of my blog posts that show related content. Depending on which post you’re reading, different content will appear based on the categories and tags I’ve chosen. Social media plays an important role in how Google views your content. Blog posts that get lots of likes and shares show search engines that your content is interesting and/or valuable. On the flip side, if your content doesn’t have as many, Google may favour other content on the web and show them higher up in search results. Most SEO software such as Moz now include social media counters to encourage you to focus on increasing these social signals. There are a number of things you can do with your blog articles to encourage people to like and share them. Include links to online influencers and brands. They’ll likely share it too. So now you have a list of things you can do before, during and after you’ve written a blog post. 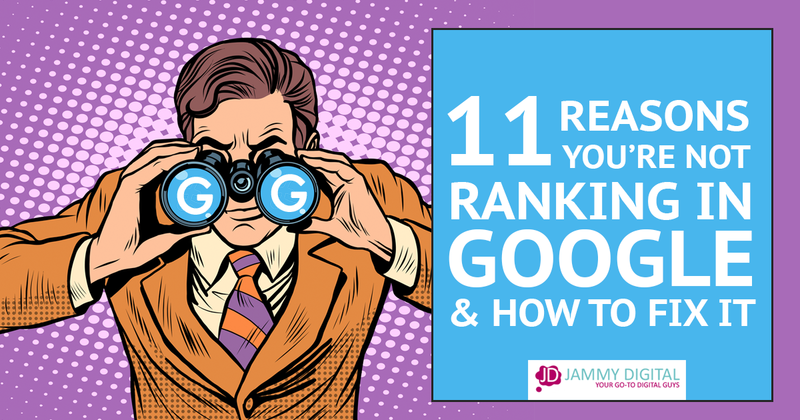 Even if you aren’t able to do every single one, you’ll still put yourself in a very strong position to rank well in search engines. I’d love to hear from you. Do you have any questions about the steps listed above? Please leave your comments below. Wow! Thanks so much @carolinemckenna:disqus That made me smile! Glad you found it useful! Pleasure, just getting started with my own agency. Scary, and fun. Good luck man. You’ll love it.